Everyone loves family games. Whether it's a card game, a board game or even an outdoor game, we all enjoy the fun of a new challenge. Some family games make us think, some games make us laugh, some even cause a few tears and the occasional bruised pride when certain children don't end up as winners! However, playing games together always draws us closer together as a family. Do you enjoy playing games? Do you wish your family played more games together? Do you wish you knew where to find all those games you remember playing as a child? On this web site you will find hundreds of free games for families and friends to play together. Whether you are looking for children's games, a simple game for two people or many parlour games for a party, you will find what you need right here. 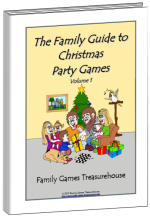 Subscribe to our FREE newsletter and you can download a copy of our ebook "The Family Guide to Dice Games" as a free gift. We have made this site very easy to navigate. Have a look below at the different categories we have included. Click on the one you like and it will take you to a whole range of family games specifically suited to that area. Then click on the game you want and you will find very easy-to-follow instructions. We have also included an index where you can search for games either alphabetically or by category (age, number of players or type of game). The index also lists non-competitive games. 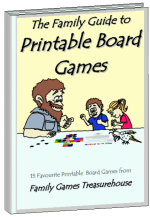 All our family games include an age range, number of players needed, a list of any equipment needed, simple rules and, if necessary, diagrams or photos to make it even easier to enjoy a treasurehouse of family games. Card games have been a favorite family pastime for hundreds of years. They are great to pull out on those rainy, wintry days. We find them very convenient to take away on vacations or camping. They certainly don't take up much room in the car. We have included many of the old favourites that families enjoy, plus some that may be quite new to you. There are card games specifically suited to children, as well as games for the whole family to play and even some to play on your own. Board games. This category includes some entertaining board games you can play together to while away those lazy Sunday afternoons or during those wonderful holiday breaks. They are very easy to make yourself with just a minimal amount of equipment. You will find printable diagrams for many games to help make it even easier for you. Parlor Games are indoor games that can be enjoyed by adults and children of all ages. They were originally known as parlour games because they were played in the parlour room of the upper and middle class families during the Victorian era. Here, you will find a wonderful variety of fun games to play together. They would also be suitable for a birthday party or just a get-together with friends. Dice Games can provide hours of fun with only a few dice and some counters. Dice games differ from board games (which also use dice) because board games only use the dice to move a counter around the board. However, the games in this section use the dice themselves as the focus of the game. Tile Games are based on either a set of dominoes or a set of Mah Jong tiles. They may not be as popular as Card games or Board games but they still provide hours of fun for very little money. Pen and Pencil Games can be played by a large group or just a couple. Don't tell your kids but they'll also improve their reading and number skills at the same time! Just grab a piece of paper and a pencil and start playing! Outdoor Games. You might need a big backyard for these family games but I'm sure the local park will do just nicely. These games will let your children run off some energy and give them a great dose of exercise to keep them fit and healthy. You will find these games are also ideal for parties and family reunions. Party Games. Everyone loves a party! Whether it's a birthday party for a two year old or the celebration of a 50th wedding anniversary, parties are a great way to promote family togetherness and fun. Family reunions, Christmas gatherings, barbecues, birthdays, graduations and even get-togethers for no particular reason are all wonderful excuses to play some games. And they're not just for families! 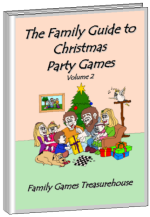 Christmas Games are a great way for people to celebrate the Christmas season, whether at a church, office or family party, or any get-together. There are games for people of all ages, including trivia games, musical games and Christmas party activities. Easter Games are wonderful for celebrating with family and friends at Easter. 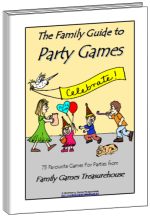 Egg hunts, party games, printables and colouring pages for everyone. Thanksgiving Games help to make Thanksgiving even more special as everyone gives thanks for the blessings they have received. Family Reunion Games make your family reunion celebration especially memorable as the whole family join together in fun. Valentines Day Games provide a special opportunity for couples and families to express their love and care for each other. These games are great for providing the greatest gift in relationships - quality time together. Word Games. These are so much fun to play straight after dinner before you've left the table. They are also great for parties, long car trips, family reunions or any time a group of friends meet together!! Traveling Games. Traveling in a car can get pretty boring for kids especially if you've been driving on the road for what seems like hours! These travelling games will help pass the time and keep bored minds occupied. Worldwide Games. Children everywhere love to play games. 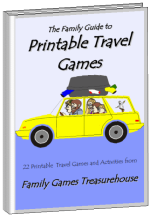 In this collection of worldwide family games, you can find kids' games from every continent of the world. You may even recognise one from your country! Educational Games. Fun, free educational games, perfect for families to play and enjoy, while helping your child with math, strategy/thinking, vocabulary and spelling skills. They are categorised into different subject areas to aid you in choosing the ones which will help your child the most. Share YOUR Game. If you have a favourite game that we do not have on our website, here is your opportunity to share YOUR game. Simply follow the instructions to add your game and share it with the world. Game Reviews for fantastic commercial games and activities that are family friendly and lots of fun! "The Family Guide to Dice Games"!